The material was collected and maintained by Lai until its acquisition by the Simon Fraser University Library’s Special Collections and Rare Books department in 2007. 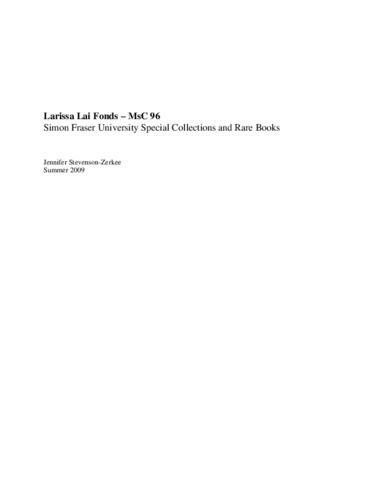 The fonds consists mainly of textual materials, including notes and drafts of Lai’s works, numerous calendars and datebooks, school materials, and material related to her activism and arts involvement. There are also a large number of photocopied reference materials on such subjects as the arts, gay and lesbian issues, racism and feminism, and Chinese culture. There are a small number of photographs and negatives, and a wide variety of audio-visual media such as cassette tapes, Hi8 cassettes, broadcast video cassettes, and various computer media. The original order that the items were received in by SFU Special Collections and Rare Books has been maintained, which was mainly rough chronological groupings or media-based groupings. The various types of audio-visual media were rearranged for storage reasons, but these changes have been noted in the finding aid. Some items were removed and photocopied or removed entirely for conservation reasons – these mainly consist of newsprint material, and have been noted in the finding aid. A small number of items were also removed for privacy reasons and returned to Lai – these mainly consist of school or employment records that contained Lai’s Social Insurance Number. This was done because she is still living and because the number of items was so small. The fonds has been intellectually arranged into 8 series, most containing subseries. Access to some correspondence is restricted until Lai's 100th birthday or ten years after her death, whichever is later. The fonds consists of 2.68 m of textual material, 48 publications, 3 sketchbooks, 19 notebooks, 2 calendars, 8 datebooks, 29 photographs : col. , 59 photographs : b&w, 2 photographs : sepia, 3 contact sheets, 7 sets of 35 mm colour negatives, 3 sets of 35 mm b&w negatives, 5 VHS cassettes, 12 digital video cassettes, 12 KCA30BRS video cassettes, 1 KCA 60XBR video cassette, 1 UCA 60 video cassette, 4 Hi8 cassettes, 14 audiocassettes, 13 floppy disks, 1 CD-ROM.